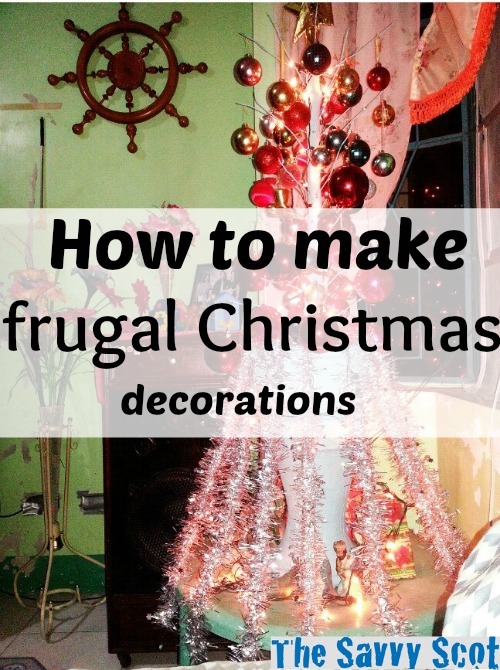 As I am not really big on Christmas, I am happy to have my VA Clarisse who is a Christmas enthusiast, talk about frugal Christmas decorations today. Enjoy! When the months ending in “BER” start, for us it means that Christmas is just around the corner! And when we speak about Christmas, we are excited to set up our Christmas tree, decorate our house with Christmas lights and stars. I love setting up our Christmas tree and decorate it with different decorations. We have a big star in front of our house and a Santa Clause standing in our door. Our Christmas tree is already 10 year old now it is older than my daughter, we didn’t throw it away because we can still use it and I think it is frugal not cheap. 🙂 My mom used to buy different larges flowerpots with branches and moss-filled on it. And now she wanted to use it as a second Christmas tree, she almost threw the large pot but decided to use it as a decoration. She repainted it to color light blue, put garland tinsels around the branches, hanged some Christmas balls, put a big star at the top of the branch, added some Christmas lights and put the Nativity scenes in the table. It’s so perfect that I couldn’t even imagine that was the old large flowerpot! And now I will share with you my family’s frugal Christmas decorations and some of our DIY decorations. This was my daughter’s project in school last year. To make this one, you only need one egg, make a small hole on it using a spoon, remove the egg yolk and egg white. Wash the egg with water but make sure to hold it carefully to avoid the egg cracking. Cut the red colored velvet paper and form a cone as a hat of Santa. Draw eyes, eyebrows, nose and a smiling mouth. Put glue below his mouth and paste the cotton to form a mustache. 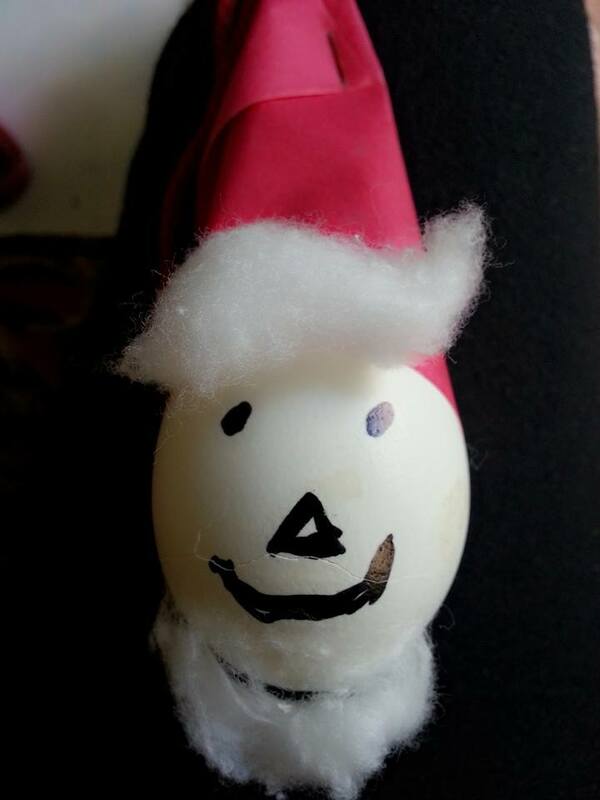 Last, insert a yarn above the hat on your egg Santa and put it to your Christmas tree. I learned this one from one of my relatives. This is very simple, you only need metallic foil, you can choose your favorite colors, mine are red, blue, white and green. Fold the metallic foils into the same sizes and cut it into a straight line. After you cut all your metallic foils, cut it into a three part and make a circle to form it a chain. Alternate the colors so that it will appear more attractive and now you have a Christmas chain, you can put it in your window, doors or even in your Christmas tree. 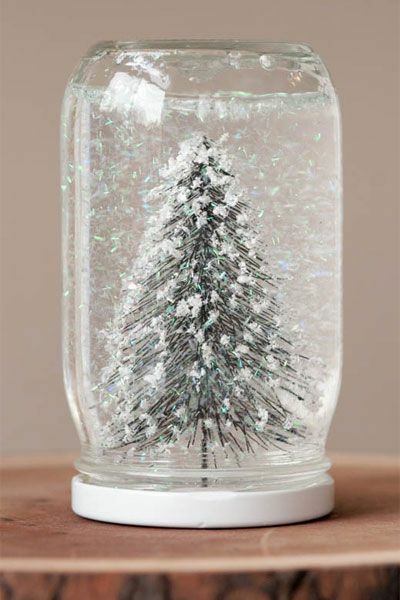 This is one of my favorite decorations, find a mason jar or any jars will do, glitters, figurine or an ornament, glue and glycerin. Put water on your jar, glue the ornament or the figurine to the lid of the jar, press the ornament and make sure that your adhesive sealant really sticks your ornament. I waited one day before proceeding to the next steps to make sure that my figurine had properly harden on the lid. Next is to put water and pour the jar to the very top. Pour glycerin on to the water, Hint: Quickly pour the bottle of glycerin for 1 second. The glycerin will let your glitter or “snow” fall down more slowly. Add the glitters, I love adding stars glitters and stir carefully to mix well the glycerin, glitters and water. 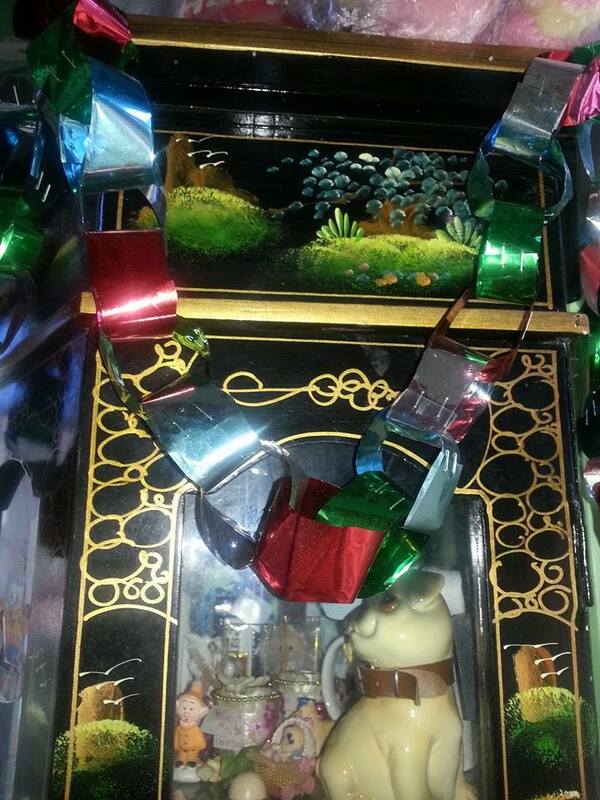 To avoid any air bubbles in your snow globe make sure the jar is filled to the top and seal the lid. Remember that you don’t need to buy expensive Christmas decorations; you can recycle your old decorations and use them next year. Christmas is about giving love, forgiving those who hurt you and asking for forgiveness. Spend this special time with your friends, family and with the people who mean the most in your lives. The snow jar is such a good idea! I have some of the best Christmas memories of stringing popcorn with my sister and my aunts. It was inexpensive and those are the memories that last. We were all together, doing something fun.